The most recent version of this project can be found here. The smart composting system monitors and manages your compost - adding air and water when needed. It tracks when your compost is ready and alerts you when a specific action needs to be taken (e.g. - stir the compost, cover the compost). This is the second prototype of the solution. Version 1 was tested inside (you can see the entire Version 1 video here). Version 2 was tested in my compost bin. The video above highlights V1 and V2. The images and data below are from Version 2 (test in compost). Per the EPA, food scraps & yard waste currently make up 20-30% of what we throw away, and should be composted instead. Making compost keeps these materials out of landfills, where they release methane, a potent greenhouse gas. Atmospheric levels of methane are spiking. This is cause for alarm among global warming scientists because methane emissions warm the planet by more than twenty times similar volumes of carbon dioxide. Unfortunately, most do not compost - typically due to ignorance on the benefits of composting, misunderstanding of what can be added to compost, and lack of desire to manage compost. Anaerobic composting causes a higher output of methane gas, attracts rodents, and emits hydrogen sulfide (smells like rotten eggs) and cadaverine (smells like a dead body). Communication to the Base Station is via Bluetooth Low Energy (BLE). 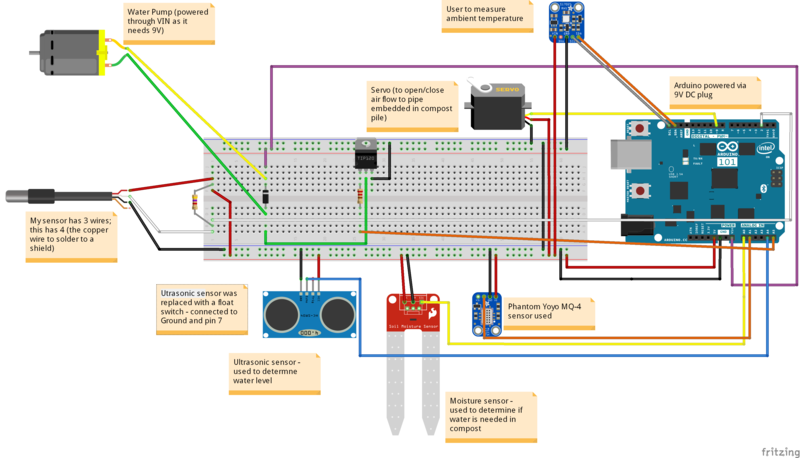 An Arduino 101 device that persists that measures the amount of kitchen scraps added to the compost bin. This is used to notify the user when the kitchen scraps bin needs to be emptied. This measurement is also used to calculate lifetime pounds of kitchen material composted. Communication to the Base Station is via BLE. Measuremmenst are taken with an ultrasonic range finder. 1 / 3 • The output of the Python script that analyzes data and makes recommendations. The script sends a command back to the Satellite system to add water..
An Intel Edison device that persists the data, performs analysis of the sensor data to make recommendations, and hosts the website. The base device obtains sensor data via BLE (via polling for the Satellite station and via notifications from the Kitchen Bin System).